Rarely has the world peace hanged on such a fragile thread. The water cannon in front of the Brandenburg Gate is directed against Berlin mayor Willy Brandt. 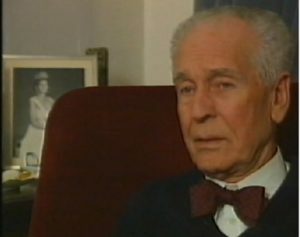 He is together with general the United States forces of Europe, Bruce Clarke and the commander  of Berlin, general Albert Watson. Gettyimages . Between the pillars are armor wagons and in front of you, nervous soldiers from the militias see the finger on the prints. 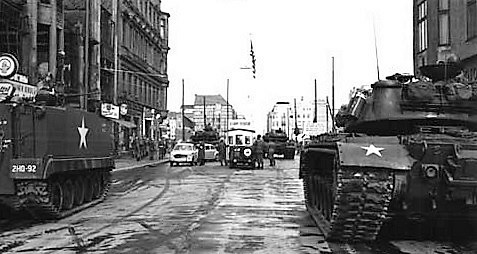 Further on to Unter den Linden, Russian tanks end up with the engines and more are heading towards the city. The day is August 16, 1961, three days after Östberlin was fenced with barbed wire. The night before, border soldiers have lost their shot against flying. Crowds on the West Berlin streets want to demonstrate, perhaps even to get through the barbed wire. Later in the day 250,000 will listen to Willy Brandt without Schöneberg Town Hall in southern Berlin. There is no high pressure beam against the three men who just turned their backs against the cannon. But if? Answered with a shot from West German police, perhaps followed by grenades from tanks with red stars? NATO A spark to World War II? If war is being allowed, the Nato countries expect Russian nuclear bombs to fall on their bases, threatening Russian government chief Nikita Khrushchev, August 11. 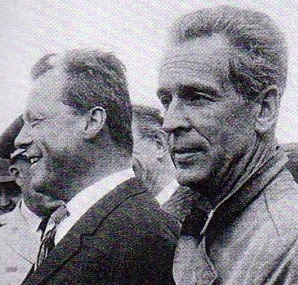 But who is the gentle man next to Willy Brandt. 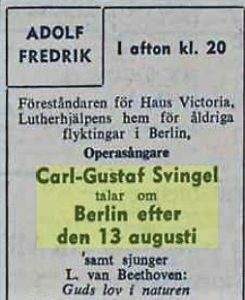 Hardly any other than members of the Swedish Church Victoria Assembly recognize him: Carl Gustaf Svingel , director of a small retirement home in the church in the suburb of Grünewald. Compare Brandt and General Albert Watson to the photo from Brandenburg Gate on August 16th. Same tie and same general: Picture . The answer to the picture should be 16 August. Even fewer understand why the Swede is there. Probably because Svingel knows the atmosphere on the east side. Cars with Western Berlin signs may not enter, but for Swedish Swingel with a Porsche labeled CC Corps Consulaire it is free passage. Diplomatic facilitates and church networks and contacts at the hospitals provide insight as few others have. If Svingel and Brandt speak Swedish with each other, there are few who understand the secrets. The clip comes from Imma Grossmann Svingel’s text ”Haus Victoria – The Swedish Recreation Home for the Old” in the jubilee writing The Swedish Victoria Assembly in Berlin 1903-2003 . 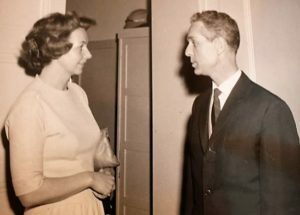 As a housewife, she took care of the Swedish-born ages from the East and also for refugees. The same Sunday morning, Imma Grossmann travels with the teenage daughters Adelgard and Heide by S-bahn into East Berlin. There they are invited to a tortoise in a colony area at the outskirts of the city accompanied by the slamming of armored vehicles. The day before, she was warned of such a journey by a person who realized something was going on. It did enough more for the week before exploding the refugee wave from the east. 40,000 arrived earlier in August, where many flew in an air bridge to West Germany . Later in the day, an angry sword came to the palace on the colony and brought us home. We penetrated Porschen through the Brandenburger Tor between barbed wire and paved cobblestones. 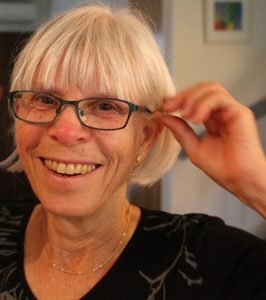 It tells Imma Grossmann’s daughter Adelgard, now living in Eskilstuna. Svingel then had at Östberlins largest hospital Charité left a package of cardiovascular medicine, syringes and vaccines he received from his pharmacist. It began the courier business every week in the years to come. ”Why are these people coming? Because the Soviet Union is preparing an attack on our people. The people in the area are afraid of the iron curtain as they fear to be locked in a giant prison. ” Willy Brandt noted on Saturday in Nuremberg where Social Democrats charged for the election to the Bundestag. Campaign trip was interrupted at night in a sleeper on the way to Kiel. Since one o’clock to sunday, the East German rolls out barbed wire and raises streets at the border. The battle with the Chancellor Adenauer became apparent and he hurried to Berlin. The mayor can take a look at the barrier of the Brandenburg Gate before the meeting with the Berlin Senate at nine o’clock. Was Svingel already familiar with the mayor? 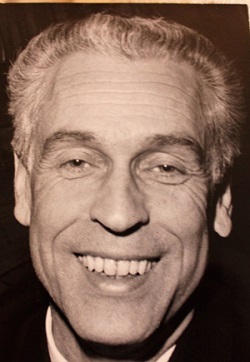 Der Spiegel writes in translation ”As a member of a resistance group against German occupation in Norway, Svingel learned Dag Hammarskjöld in Stockholm (later UN Secretary-General), became friends with young diplomat Raoul Wallenberg and grew acquainted with emigrants Willy Brandt and Bruno Kreisky ” . Haus Victoria. Kyrkoherde Heribert Jansson, Consulate General Östen Lundborg, Carl Gustaf Svingel and Rut Brandt. From Imma Grossmann-Svingel’s archive. Rut Brandt and Carl Gustaf Svingel. From the archives of Adelgard Göhran. Or did the Svingel family Brandt feel through Norwegian wife Rut Brandt , whom Willy married 1948? Norwegians in Berlin participated in the Swedish Victoria Assembly. The image from Haus Victoria with Svingel, Östen Lundborg and Rut Brandt can be dialed until 1960-1964 when Lundborg was a Swedish Consulate General in West Berlin. For details to judge probably 1960-1961. Click to embed image from Wikipedia. Willy Brandt and General Albert Watson will also see a picture from August 20 when they, together with Vice President Lyndon Johnson, receive the US troop reinforcements . That Svingel then met Willy Brandt can not be ruled out but is less likely. President Kennedy calls 140 140 reservists and sends 240 hunting plans to Europe. 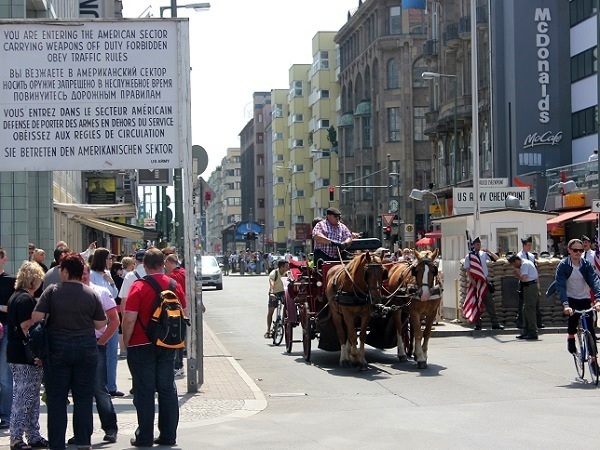 A civil-dressed US officer in a US-registered car refuses show play for the People’s Police at Checkpoint Charlie. This happens October 22 and is a strict interpretation of the Potsdam Agreement, which provides free movement in the city for occupation powers. General Watson hardens hard and lets US-plated private cars make turns in East Berlin escorted by jeeps with armed soldiers. When the people’s police failed to stop such a convoy, the Berlin crisis is a fact. Friday 27 October, the legitimacy requirement is close to triggering a world war. Khrushchev shakes with nuclear weapons. With his own words, not much Germany will be left to reunite. Frenchmen staff the gunmen at the border posting. English and American tanks direct the cannon pipes east at the sector boundary. Infantry is fighting in Tiergarten. President Kennedy’s military hawk, General Lucius Clay , commands four armored vehicles to Checkpoint Charlie. More tanks stand ready in the neighborhood and a helicopter hover above. The Russians and East German respond with charge from their side. T34 and T54 tanks rage at the border with the cannons westward. As they advance along Unter den Linden, the British respond with armor on the other side of Brandenburg Gate. 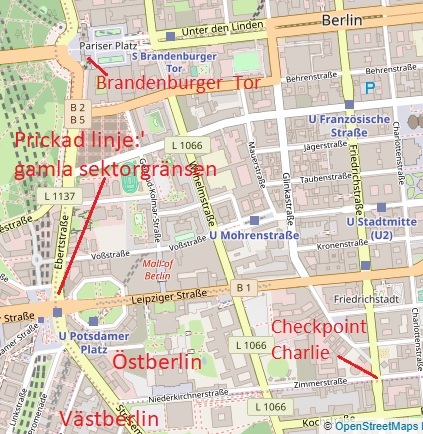 The morning of October 28, Carl Gustaf Svingel appears in Checkpoint Charlie in his white Porsche. Charité needs acute medicine for meningitis. He refuses to stay in the US post office and, after the white border, he sees a horror of how two Russian tanks drive towards him. In the rear-view mirror, he detects two American Pattontanks tightly behind. 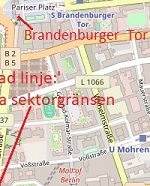 After a word exchange with a Soviet soldier, the Russian trolley draws three meters and Svingel can continue to the hospital. All according to the Spiegel , who usually cares with the fact. The power measurement is in progress for 16 hours until eleven the same saturday. Then the armored vehicles gradually sharpen in each direction. The throttle will ease even if two American combat plans stroke across East Berlin. Ultimately, it was Khrushchev and Kennedy who pulled in the threads. The US president turned out to be harder than when he was in office in June in Khussia in Vienna. October 30, the Russian leader is responding to blowing a nuclear megabomb on Novaja Zemlja. In November, Svingel participates in the Swedish Lutheran aid meeting in Karlstad. He then fits into a Stockholm church telling about the latest events in Berlin. Certainly with a collection box in standby. Instead of aging in the DDR who can no longer reach Haus Victoria, the guesthouse has become a haven for refugees from the East. – Then came the wall in 1961. It did not take long until the church asked me to be a courier. It told Svingel in the singer Siv Malmqvist’s TV interview. 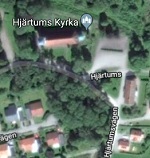 Lutherhjäpen. German Lutheran Church and Diakonische Werk asked me to be their representative, he explained. Carl Gustaf and Imma Svingel in the apartment on Fasanenstrasse. 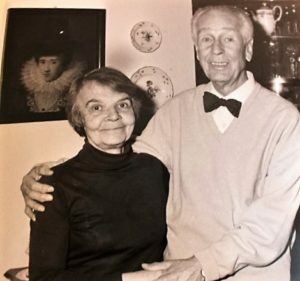 Photo from Adelgard Göhran’s archive. – My view was that one day, this wall will come with brackets and noise to collapse. Because it is built on murder and hatred. 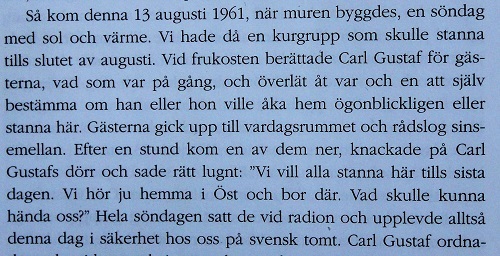 That prediction gave Svingel in Bo Holmström’s television report The Unknown Heroes.